The shower invitations from my last post were put to good use today! We had the shower and it was great. Everything turned out so nice. I even helped my aunts with the flower arrangements. 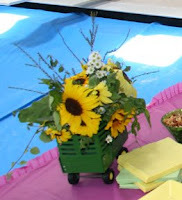 I made a flower arrangement with a John Deere tractor in the middle. It turned out sooo cute. I don't have *that* picture (shucks), but here is one that my aunts made that night. The shower (and the wedding) have a John Deere and farming theme.